The Rebel Sweetheart. : Foodie Goodie | Kongnamul Guk (Korean Bean Sprout Soup). 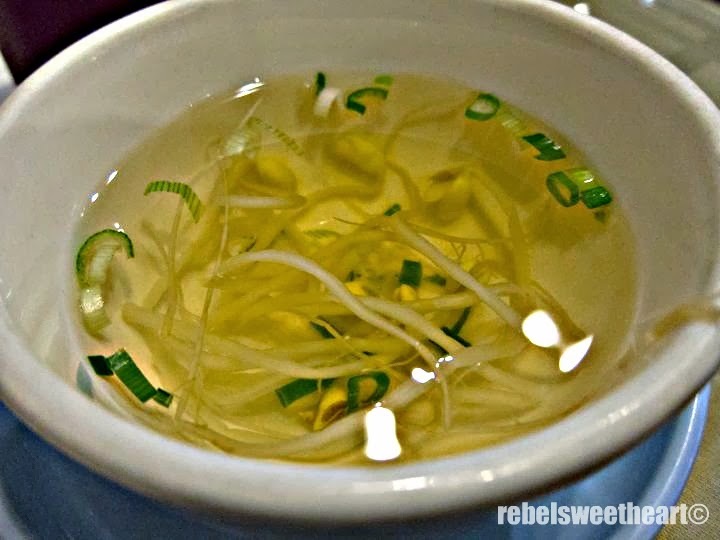 Foodie Goodie | Kongnamul Guk (Korean Bean Sprout Soup). It's 21°C outside, and boy, it sure is chilly. Times like this call for a hot cup of cocoa (complete with marshmallows, hehe) or better yet, a piping hot bowl of soup. I've been craving for Kongnamul Guk (bean sprout soup) since the other day, but since there's no Korean restaurant within my area, I decided to just learn the recipe and cook it myself. I'm sharing the recipe below, in case you'd like to give this dish a try. It's very easy to make, and the ingredients don't cost that much (they're quite cheap, really). This healthy dish is low in calories and packed with vitamin C. It's great for hang-overs, and when added with the chili flakes, makes a good cure for colds as well. 1. Wash the soybean sprouts. Be sure to remove any spoiled tails (those that are brown in color), and drain them afterwards. 2. In a pot, boil the water on high heat. Add the anchovies and kelp in a strainer, and submerge it into the boiling water. 3. Let it boil with a lid on medium heat for 15 minutes. Skim off the foams. Remove anchovies and kelp from the broth. 4. Add the soybean sprouts into the broth. Boil with a lid on high heat for 10 minutes. Make sure to boil the bean sprouts with a lid. Otherwise it can result in a slightly unpleasant smell. 5. Add the garlic, chopped green onion, and red chili pepper flakes. Let it boil for 1-2 minutes. 6. Season with salt. You may choose to add more, so season it gradually while tasting the soup. 7. Turn off the heat, and serve in a bowl. I like the idea of adding the chili flakes. This sounds wonderful on a winter's day. Never thought bean spouts can be made into soup. Thanks for sharing :) Will try to do this. I have never heard of this before, but it looks so yummy!! In the winter time I love eating soup on a cold day. what's the diff between a mungbean and a soybean sprout? I mean, taste-wise? I have tried the mungbean sprouts only; not too sure if i've seen a soybean sprout in the groceries that I frequent, lol. but this recipe sounds interesting! want to give it a try. bookmarked! Makes the Sinulog Festival more exciting. I wish to experience it in the coming years..
That looks so delicious and fresh.